Our Bing Ads research team has joined with the Intent Lab, a joint research unit of Performics and the Northwestern University Medill School of Journalism, Media and Integrated Marketing Communications, in an effort to help customers make personalized marketing a reality. The Intent Lab is focused on improving the understanding of online consumer behavior and decision-making processes and identifying ways to strengthen brand relevancy and engagement. 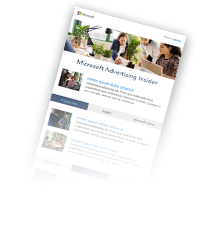 Designed to identify key consumer mindsets as the searcher progresses along the consumer journey, the research has helped uncover several insights that can help customers better align their advertising to the consumer decision journey. For example, the findings help us better understand the abstract thinking consumers employ early in the purchasing journey, and how their thinking becomes more concrete as they move closer to a purchase goal and begin searching for things like price or location of purchase. The words used in search queries can reveal the mindset and intent of the consumer, and this information can then be used to get in sync with consumers in their search and decision-making process. The research also revealed that when advertising copy matches the consumer mindset, consumers are more likely to click on the ad and be open to its content. When consumers use search terms like "how" or "what" — which are considered abstract — they are more likely to click on an ad written using similar abstract language. The same holds true when concrete search terms like "best" or "top" are used: consumers will click on ads that feature concrete language. For more insights like these, and to learn how to align your advertising to the consumer mindset for improved clickthrough and conversion rates, join our Re:search with Bing - Predict the CDJ with Linguistics webcast on December 6, 2018 at 8 a.m. Pacific Time. Register now and you can join us for the live webcast or view it on-demand, when it is most convenient for you.